The Gunners travel to Manchester with memories of last years embarrassment in the back of their mind, last seasons match at Old Trafford was one to forget for Arsene Wenger whose team was outplayed at the Theatre of Dreams. The result, 8-2 in United’s favour, was a shocker for both sets of fans. United fans were the happier of the pair after a convincing win over a highly rated opposition. The fixture was played early in the season which capped a promising start to Uniteds 2011/12 season. After winning their 19th league title the season before, confidence was in Uniteds favour. United were expected to win the game but not by such a margin. In Wengers defence, he was without Thomas Vermaelen and Bacary Sagna to add to various previous injury and suspension problems, so Carl Jenkinson played at right-back and Johan Djourou in the centre with Francis Coquelin making his debut in the centre of midfield. The match was a barely believable stream of United chances in an amazingly dominant display. Arsenal were wretched from start to finish, completely unable to make the most of their numerical midfield advantage and remarkably disorganised at the back. Now back to this season…..
United have shown inconsistent form so far this season and prepare to take on an Arsenal side in similar form. Many Arsenal fans thought that, without their no.10 and captain V.Persie, their Arsenal side would struggle this season but so far The Gunners have proved otherwise. Santi Cazorla and winger/forward Lukas Podolski have been on top form for the Gunners and proved to be decent summer signings. United’s attackers have been particularly impressive so far this season having scored the most goals. But this won’t come as a surprise with forwards like Van Persie, Rooney, Hernandez and Welbeck in the squad, the only real let down has been the defence who have been good but not yet on top form with injuries taking its toll on the team. For me, I think Rafael has been in top form while Buttner, who’s been rotating with Evra, also looks promising, but last nights fixture against Chelsea wasn’t Jack’s (Jamie Redknapp) Buttners best game. United impressed at times this season with wins at Anfield, Stamford Bridge and Sports Direct Arena (St James’ Park) which have broken some unwanted recent records. Although losses at home to Spurs and away at Everton have been disappointing, they were good performances from the Reds on the whole. These have been the only two losses for United so far in the Premier league this season and we don’t wish to add Arsenal to that list come Saturday. I think the game could go either way but United will just edge it….. I’m not talking about an 8-2…. Maybe a 3-2 United, with United taking a 2-0 lead, Arsenal equalising and hopefully a late goal from Hernandez to seal the deal. I am talking about 8-2. The 8-2 was an anomaly for this fixture and so I doubt it’ll happen again. Arsenal have a better organized team this year. They are designed to absorb more pressure without buckling and are resilient when the opposing team puts the physical hammer on them. The big problem for them is that they no longer have the standout players that we need to worry about. RVP (hee), Adabaye, and Fabragas are all gone – sold for the pot and not for the cup, Le Arse cannot dominate or boss the top teams anymore. They are trying to pretend that things are “better”, but in fact they are just making things a little more “presentable”. le Arse to win 2-1 after a last minute goal in Fergie time. Enjoyed the article and agreed mostly but you say that “Although losses…at Everton have been disappointing, they were good performances from the Reds on the whole”. Everton was a good performance, really ? Great preview. Although i have to add, we don’t have to worry much. My boys are good enough to do the job on arsenal. Webb, mark, dean..
Hope you are all looking forward to tomorrow’s game because i certainly am! I just wanted to get ppl’s view on how we will line up tomorrow and what tactics do you think we will employ. I persoanlly think we need to play 2 up top tomorrow especially as Arsenal’s defence is not exactly the strongest in the league, but then again, neither is ours for that matter! Unless we play a high tempo physical game (Arsenal do not normally tend to assert their authority on the game when the match is physically and fast paced), I feel that we could be looking at United implementing a style similar to the Chelsea game last sunday, where we were compact, disciplined and restricted the space in between the lines for quality players such as hazard, oscar and mata to operate. Obviously we only managed to keep this up for only 35mins of the 1st half on Sunday because from then on Chelsea upped the tempo, pressed higher up the pitch and it was clear that we became 2nd best. That coupled with the fact that we decided to drop back and defend even deeper! I just hope we dont play a negative tactic whereby we sit back, contain and then hit them on the break! We are playing at home FFS so we should be the ones trying to dominate and taking the game to them! I also think its imperative that we compete in the midfield tomorrow especially with the quality Arsenal have in there cos lets face it, they do have a better midfield than ours! Even though I think we will play up top I am still in 2 minds about how SAF will line up tomorrow in order to incorporate 2 forwards….will it be the narrow diamond which will mean the sacrificing of width in order to compete in the midfield with a view at gaining the upper hand or will we play with width by still incorporating 2 forward players (trequartista + central striker) however this could affect how we compete in the midfield! I personally feel we will play with width due to the simple fact that we are playing at home and both Arsenals wide players and full backs are not exactly the best defensively therefore I feel we will try to exploit the wider areas and at the same time spread out Arsenal as much as possible to allow central players such as RVP and Rooney the room to operate and influence the game in the final 3rd! I hope SAF opts for Rooney, RVP and Chicha and the only way to do this is by playing Rooney in midfield with the licence to roam forward to join the attack however this could leave us exposed in central midfield if SAF goes down this route! Chicha needs to play in order to impose his pace on the game especially as Arsenal do not have the quickest of centre backs! Having said the above i wouldnt rule if we line up like this tomorrow in a 4-4-1-1 / 4-2-3-1 formation with Rooney in midield!!! Rafael will have have to be on top of his game,as he has been this whole season,to deal with the impressive Podolski. I hope Anderson starts because of his performance in midweek and he can battle in midfield.Our midfield will have to put the pressure on because Carzola,Arteta and Wilshere will keep the ball all day.I’m sure we’ll go with a similar line-uplike that gainst Chelsea on Sunday because Arsenal’s full-backs are there for the taking. I’m looking forward to another high scoring game. Both team can’t afford to sit back and defend as the both have not defending well lately. Hope to see RVP score against Arsenal. I wonder how he and Gunner fans will react. I have a feeling that we will lose this game. They will dominate our midfield unless we go with the diamond to somehow stop their central flow, but we will concede anyway so I expect Fergie to play the dangerous 4-4-2 to simply outscore them. Arsenal have a mean defence in the Premier League and completely nullifed Yaya Toure with their passing. All the onus is on Michael Carrick, our only decent central midfielder. Once again, it is RVP who fills me with hope, we find ourselves in dire need of his clinical finishing and hold up play. Do not start Hernandez/Welbeck. Agreed Moscow mate. Last week i was all for the 4-4-2, as once again it seemed/seems like a formation that does work well against chelski (for whatever reason). With arsenal though, i think its imperative we go with the diamond once again so as we have that extra man in midfield. Carrick on his own is gonna have to be on top form to deal with carzorla whose been fantastic for them, and thats without mentioning arteta and wilshere whose now back fit, and will pass us to death on their own. I actually would go with hernandez personally. Think hes actually done quite a bit of work this season working on his all round game. Hes been keeping the ball better, and timing his runs too. Still needs work obviously but i do think people are under rating him when theyre saying hes still a lousy all round player and always offside. Arsenals defence has improved ten fold without question, but i still think it has its weaknesses. So i myself would go with hernandez anyway to exploit them. Something like the below would be good. Still have my reservations regarding the diamond, but for me a 4-3-3 just wont work with valencia in it. Unless its contains nanis name, i think id just prefer to go with the diamond in this instance. Just please no scholes or giggs. Ian, are we not replying anymore? Also content clipped on the right side by ads etc. Moscow: Definitely Welbeck or Hernandez. I like Welbeck better because he can play wide if we need more width, but with the Pea knocking ’em in, it’s a hard call (off the bench, i think). The RVP, Rooney + one other striker combo, is producing goals galore and I wouldn’t want to break that up. It’s really our back 4 that need help from the MF and so I would always prefer the diamond now because we can put in players to help them out. Our poor defense is Job 1 for this team and without Vidic, and with Rio on his last legs, I say put Carrick in front of them and keep him there. We then need 2 more and that can keep and win possession – I’d say Fletcher and Valencia, or maybe Cleverly. No room for Nani or Young and so either a diamond or Valencia and Welbeck playing wide. Predict: 2-1 United, Le Arse scoring late to make it interesting! Hernandez has got his finishing touch back and Welbeck showed a few nice touches against Chelsea on Tuesday night. Not enough to warrant inclusion. If we start with a front four of Valencia, Rooney, RVP and Young/Nani then hopefully we can take Arsenal apart like we did Chelsea in the first 30 minutes. Then introduce Scholes in the second half and pack the midfield. Ian, could we please have the reply icon back? I’ve got no idea where it’s gone, I’m working on it, sorry all. @Ian: Here we go…..looks like it could be fixed! If this indents to the right slightly I think we’re in….if it doesb’t….I’m about to tear this PC out of the wall and launch it out the window! @Redrich: For some reason you now have to hover over the comment you want to reply to (on the right hand side of it) to see the ‘Reply’ option appear. No idea why this is lads other than installing a few updates recently, must be something in one of those. @Ian: @Ian: and it’s also stopped tabbing across to denote a reply. Doing my head in trying to fix it tbh! Leave it with me. I have only to questions after saying ‘good win’. Question 1 – I have noticed teams know we are susceptible to late goals against us, so they make a late charge. I have also noticed, for some fook knows why reason, we always slow, or drop the pace in the last 15 to 20 minutes, and continually invite the opposition on to us – WHY WHY WHY??? We are no good at keeping the ball, to keep control of the game in the latter parts of games. We cannot blame the defence in today’s game, they were fantastic, and so were our young lads in the 5-4 loss to Chelsea. Other teams should take note, that sustained attacks on Chelsea, will lead to goals, there defence is not that good. Chelski had to bring on the artillary to beat our young lads in that game! Question 2 – Chicharito is OUR FORM striker, he would have had a field day today, and SAF fookin leaves him out – WHY? @Craig Mc: oNE WORRYING SIGN WITH aNDO AFTER HE FLEW PAST aRTETA HE STRUGGLED TO BEAT mERTESACKER IN A RACE FOR A 50/50 (oh ffs caps!) ball. If you can’t beat him in a race you may as well give up! tbh Craig, I thought we took our foot off the gas straight after we scored, we let them off the hook all game, if we’d gone for the throat we could’ve murdered them by half-time, and given the circumstances in which we lost the league last season I’d suggest sniffing out a wounded weakened animal and going in for the kill is something we would’ve learned, but by today’s showing…..obviously not. PS: Did you see the weird shirt-exchange of RvP at halftime… so odd! It was an annoying game. Neither side seemed to care after we went 1-0. Arsenal refused to attach (to avoid counter-attacking avalance) and we just allowed Arsenal to keep ball in their own half. Unbelievable how many times our crosses were wasted — Young + Valencia truly sucked BIG TIME today. Cazorla’s goal looked nice (and was their 2nd and last shot on goal) but it was all due to Anderson’s lack of defending. Look at him after the ball goes into air. Cazorla moves towards ball, Anderson stands still and watches in front of goal… goal. We should have won 4-0 if our shooting boots were on or Chicharito played. — RvP, Evans, Rio, Evra, Carrick (defensive), a poor poor Arsenal. — Team performance, Penalty, final 1/3rd passing, finishing, crossing. Young, Vally, Cleverley. We have now won against Arsenal, Liverpool, Newcastle, and Chelsea…. pretty decent. Not themselves: Valencia, skips past Santos, can’t cross??? Not given enough time: Nani, are players refusing to pass to him now? Rio – Excellent interceptions, followed by unhurried kicks into touch. Evans – consistent, you can depend on him for at least 1 mistake/game. Anderson – two half-decent games in a row! Now if only he were fitter. Carrick: Mr Invisible, except when giving dangerous passes to Arsenal. Young: aside of tripping when anyone breathes on him, what’s his role? 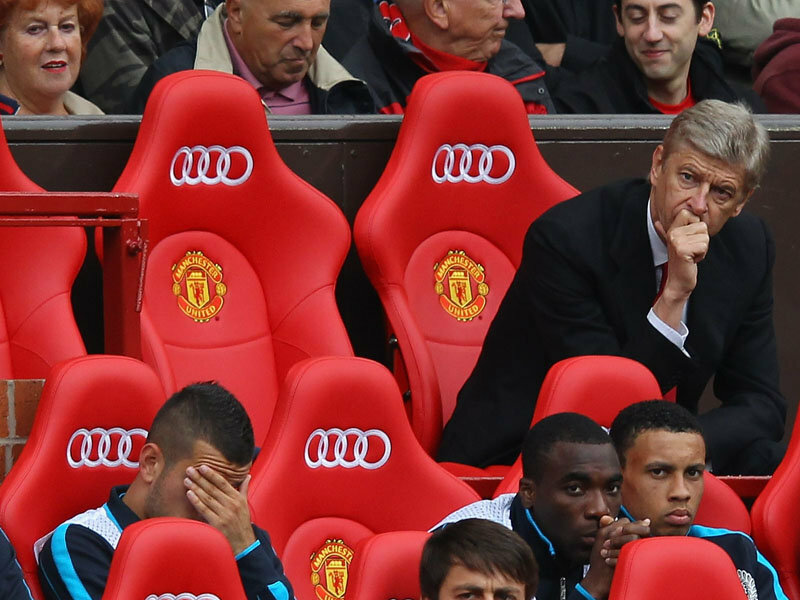 Team performance: insipid, turgid, casual, sleepy, sloppy, couldn’t be bothered to get off their arses. A picture match imitation of what Fergie did the whole game: dither! Why was Chicharito not brought on for Young to make the game safe? Keep playing like that, keep dithering on substitutions (almost even with Cleverly) and we shall be in for a real hiding one of these days. And not by a top team necessarily. Even a mid-table team with no fear, and full of running, would have whipped us today. Fergie, what will it take for you to wake up your team? Giving away a goal ala Everton last season, and once we are 2-2 drawn or 2-3 down in the last 10 minutes of a game, is that when we’ll see a flurry of changes, Chicharito coming on, Young pulled off, and Fergie prowling the touchline, chewing gum, and looking at his watch? A stable of pedigree horses; being conditioned to race like donkeys.